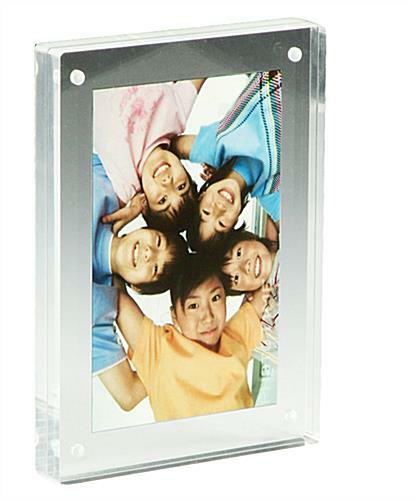 4" x 10" 5" x 7" 6" x 14"
This Acrylic Magnetic Frame is one of the coolest photo holders sold at a low price. 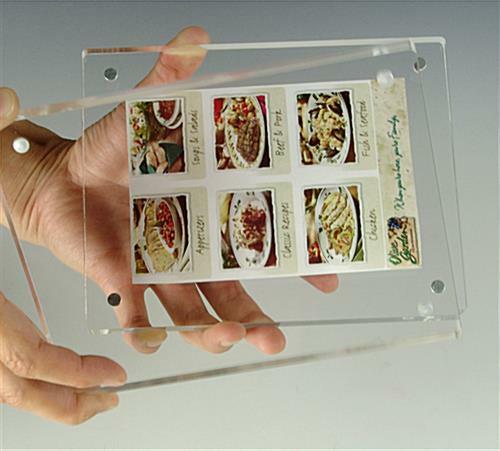 This stylish sign holder, acrylic magnetic frame is not only a great merchandising solution but also works well as a decorating tool at your reception or ceremony. 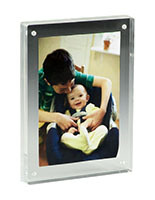 This acrylic magnetic frame provides a neat and sleek way to display your favorite photos or advertising information. 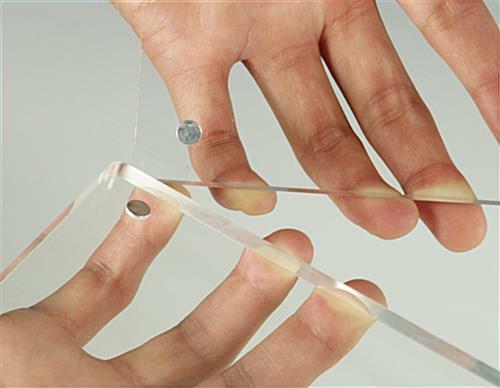 Four tiny surprisingly-strong magnetic pins securely hold two 3/8" thick clear acrylic blocks together and allow the graphics to be easily changed. 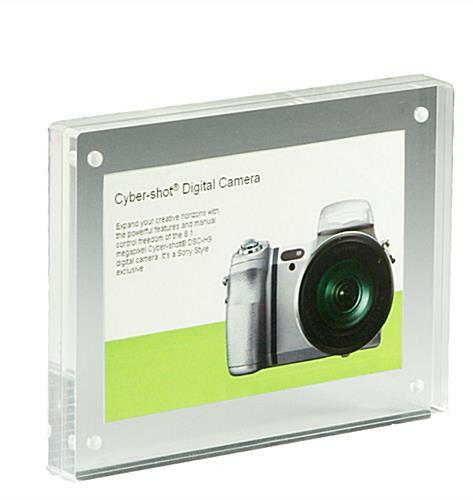 This 4" x 6" photo holder, acrylic magnetic frame is a very popular tabletop display and can be used in either vertical or horizontal orientation. 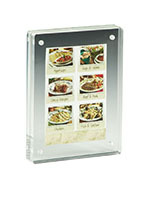 6.8" x 4.9" x 0.75"
This is a great item, it gives a professional look at meetings and conferences. Table tents are fine, but when you need to go that extra step and need to make a statement, this is what you need to use. Have used these in various meetings, conferences and always receive compliments. Great for messages to groups when they arrive at a table or session. Thanks for the great review, Carol! 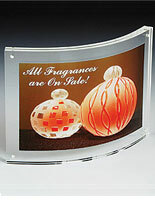 We love helping our customers make a real statement with their messages! Best of luck to you at your next event. 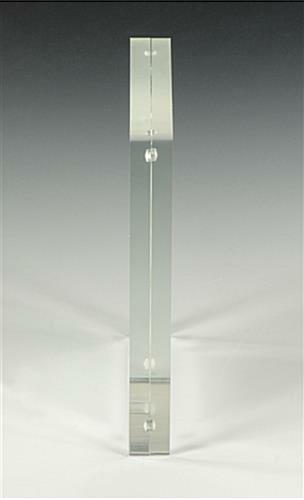 We are very happy with the quality of this product and love how they look on the furniture in our trade showroom. We will most likely order more in the near future! This is gorgeous, Emily! Thanks so much for taking the time to send us a review and snap a photo! We hope you shop with us again soon. 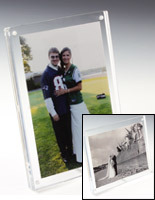 The frame was solid clear acrylic and perfectly packaged. The frame construction had 4 points of contact where others would have only two. This adds to the quality and is a big plus in the design. I only wish the acrylic could be tinted and come in other clear colors. 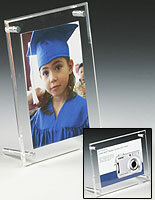 We have ordered these frames for our Board and inserted an certificate of participation inside. It can also be used for a photo if one wishes. These were so well received last year, we ordered them a second time. We are glad you were so happy with your order, Sharon! Thanks for the feedback. nice product will order again in the future.